This post is different form my usual posts about writing. It touches a matter close to my heart. Racism. Like many immigrants, I have faced racism in America. The first time came as a shock, but later it learnt to ignore it, labeling it as 'ignorance' rather than 'prejudice,' although I know it for what it was. Coming from a privileged background in India, a Brahmin, An Indian Air Force Officer, and a doctor, I faced racism from an unemployed American white woman who wanted to rent out a room in her house. She told me she has come upon difficult times and while she usually rents to doctors and lawyers, she has to 'stoop' and rent to 'scum' students. I was a PhD student. I didn't tell her I was a doctor. I turned red and asked if there was a bus stop nearby; as a new immigrant, I didn't have a car yet. She gave me a dirty look and said, "You'd have to ask the cleaning ladies." I rented a place in a poor immigrant neighborhood and was happy to dwell with the 'scum' as she put it. My neighbors were cleaning ladies and plumbers and carpenters and handymen and a few starving students. We lived in harmony. That was twenty-five years ago. Even now, prejudice is rampant, but I am protected from it in my 'nice' neighborhood (also with lots of immigrants of color), and behind my whitecoat. In these troubled times when people are differentiated based on their skin color, gender identity and political views comes an important book by De. 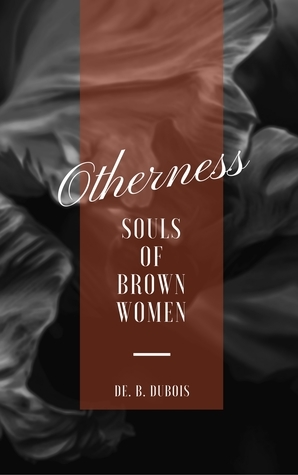 D. Dubois, called "Otherness: Souls of Brown Women." This book comes during troubled times. What made you write it? Have you ever faced overt racism or microagressions? If yes, tell us what happened, how you responded, or if you didn't respond, what you felt you should/could have done. When in 1903, "W. E. B." Du Bois’ wrote The Souls of Black Folk, he wasn’t referring to one instance or decade of troubled times, but was referring to the collective struggle of the Blacks as they went through slavery, lynching, racism, discrimination, struggles to be accepted as humans – emancipation, etc. Albeit my book is out at a time when these troubles with “Otherness” are visible again, however these thoughts are well felt from the moment I was exposed to foreign education, and also to some extent education in my own country of origin – India (more of it in the book). It is a culmination of these combined experiences, as a woman and a brown woman, who literally grew into her adulthood in a white world that made me appropriate W.E.B. Du Bois’ black and male perspective, to fit my brown and female observations. Which surprisingly isn’t very different.1903 or 2003… century has passed by, yet mentality hasn’t changed. People try to quell their memories of WWI & WWII, supress memories of genocide by whitesplaining through “western guilt” concept, blame shifting or bigoted neglect. Fact is, the coloured were and are still oppressed. That brings me to this, yes; I have faced many sides of racism and (not so) microaggressions. Apart from India, I have lived/studied/worked/travelled in many countries around the globe. The aggravation started in Australia. Which was quite mild in today’s comparison. In Australia, people would simply start talking to me in Spanish as to them I couldn't have been an Indian. A perception, which is innately discriminatory – and we as Indians know that: North vs. South, stigma of “light skin” vs. “dark skin”. But this discrimination intensified as I remained abroad. When I got married to as Swiss, my first slap came from my sister-in-law, who openly discriminated against me, by saying – “she is marrying my brother for the papers”. Papers – as at – to her it was clear that 3rd World people are refugees in 1st World countries. Ignorance. I tried to talk to her and “enlighten” her, but only so much can be done when someone’s mind is made up. We ended up never seeing each other again. A huge step for a family-oriented Indian woman. But to be able to have that choice was liberating. My next big slap was when I enquired for my Bachelor’s (to study English) at the University of Fribourg of Switzerland, I received a negative reply that read: “in order to do your Bachelor's degree in English language with us, you need to complete a Bachelor’s degree in English from your country of origin”. Which was completely absurd as even Cambridge University wouldn’t have such expectations from their candidates! And I had nothing that I could do about this. So I decided to carry on with Design education. Where, if you read the first paragraph of my opening chapter, you’ll know exactly what I was facing from my classmates: discrete implications of my foreignness, and thus inferior origins! Honestly, I don’t know what I’d do if I hear one more person making fun of Indian accent – on my face! Or, telling me that India only has Punjabi MC for music! Even today, this hasn’t stopped. I get side-tracked, dissed and shunned based on my skin colour. If I point out racism I get hissed at and hushed by my new countrymen and women: Swiss! Note: To be a Swiss, one needs to have mastery over any one of the Swiss national languages and a working proficiency in another Swiss national language is a plus. Applicants must know Swiss history, culture, politics etc., when presented in front of a panel of judges. It is so difficult to be a Swiss, that there is a saying in Switzerland which goes like so: new Swiss national are more Swiss than “actual” Swiss! However, when you are “coloured”, all of that doesn’t matter. To the point, recently during a heated situation, I got discriminated by a German girl, telling me “I don’t understand how people like you get to be here…” … where “people like you” meaning coloured people from 3rd world countries, and “here” stands for the obvious – Switzerland, and studying for a Master’s degree (and despite getting excellent scores, not allowed/asked to exhibit at the final exhibition). Discriminated by a foreigner in my country because I am a brown woman, who speaks French as her main language in Switzerland (French is one of the 4 national languages of Switzerland) instead of German! Yet, I guess my biggest scar was when I missed my tram to college (The Basel School of Design) and was running to the next tram stop to catch the same tram. As I was crossing the pedestrian crossing with no stoplight for pedestrians – a car sped-up to the point that I had to jump to the other side to avoid being run-over (in Switzerland, no stoplight for pedestrians automatically implies that pedestrians have an upper hand and may cross at their free will – vehicles have to stop for the pedestrians). As I turned to look, the car stopped right in front of me. The driver rolled down his window and spat at me! Yelled in German, of which back then I only knew the word “Ausländer“ or “foreigner”; and drove off. Till this day I get nightmares: his livid face yelling at me. 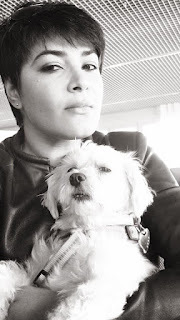 Yes, I face racism – as on top of being brown I am everything that goes against every grain of understanding and belief about brown women, and what she should be. I am articulate, I have a mind of my own, and if need be – I can beat these privileged non-coloured men and women at their own game– that makes me someone they get easily scared of – that makes me dangerous. You see, when I meet someone new, they don't necessarily like me, nor do they dislike me. But they are aware of my difference. Sooner or later this difference – which is first and foremost based on my colour and my gender, and then what the two stand together for in my country of origin, and how I defy that generalisation – that scares people. And yet, like any good brown woman, I step back in self-questioning. Sometimes I sympathise, as I see what privilege and ignorance does to people. I am perhaps in the best position to know that as in India I grew up as a privileged Brahmin girl with quite a remarkable (in terms of modest Bengali) lineage, and yet here I am – in a foreign country, fighting against any bigoted white privilege that intends on keeping me (along with many other women of brown heritage) down; just so I can have equal opportunity as a hard working and educated human. What I can do to aid this “brown” situation is – write. If I can put my thoughts and experiences out, perhaps this will give brown women courage to stand up against any kind of oppression. Perhaps my writing can make people aware of these problems – that first come from our brown world and then are reflected back on us through non-brown mirrors.